A very nice hotel with friendly and efficient service. Walking distance to the bus and to the Guggenheim which is why we went to Bilbao. Happy with our stay. We had the buffet breakfast which was good, and we also had room service for dinner which was also good. My primary school aged children loved using the bidet (?!?). The beds were firm and very comfortable. Where to find Bilbao hotels near an airport? How can I find hotels in different Bilbao neighborhoods? Where can I find hotels in Bilbao that are near tourist attractions? Heading to Bilbao? There's a broad selection of hotels and apartments from which you can choose. Spend some time checking out Expedia's 56 accommodation listings, all of which can be found within a 0.1-kilometre (0.06-mile) radius of Bilbao's city center. Among the most centrally located accommodation options of downtown Bilbao are the Gran Hotel Domine Bilbao and Hotel Miro. El Ensanche is a popular accommodation area. El Ensanche is 0.6 kilometres (0.4 miles) from downtown, and boasts 20 hotels. 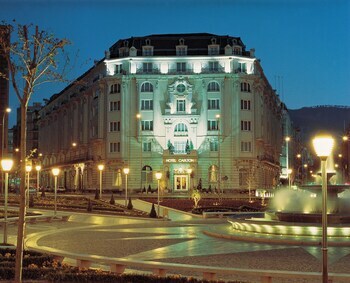 Some of the hotels in El Ensanche include the Hotel Carlton and Edificio Santiago. Another place you could stay is Derio. 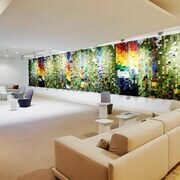 Derio offers the Holiday Inn Express Bilbao and Hotel Seminario Bilbao. Or, you could try Barakaldo, where you'll find the Novotel Bilbao Exhibition Center and ibis Bilbao Barakaldo. Mungia is 13 kilometres (8 miles) from Bilbao's downtown, while Menaka is 16 kilometres (10 miles) from the main part of Bilbao. The Palacio Urgoiti and Casa Rural Errota-Barri are situated in Mungia, while Casa Rural Urresillo Landetxea and Casa Rural Bekoabadene are located in Menaka. But of course, a trip to Bilbao wouldn't be complete if you don't take a trip to the Guggenheim Museum Bilbao. The Melia Bilbao and Abando, are all within strolling distance from Guggenheim Museum Bilbao. Stay near the Santiago Cathedral by arranging a hotel room at the Apartamentos Turisticos Atxuri or, alternatively the Hotel Sercotel Coliseo. If you would prefer to stay near the Bilbao Fine Arts Museum, you could try the Barceló Bilbao Nervión or Hesperia Bilbao. The Zubizuri Bridge and the Plaza Moyua are two more often-visited Bilbao attractions. The Petit Palace Arana and the Zenit Bilbao are near to the Zubizuri Bridge. While the NH Collection Villa de Bilbao and the Hotel Ercilla Lopez de Haro, are near the Plaza Moyua. Bilbao features a selection of economical hotel options that will satisfy even the thriftiest vacationers and travelers. 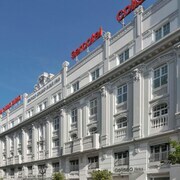 The Hotel Conde Duque Bilbao is 0.6 kilometres (0.4 miles) from the center of Bilbao, while the Mercure Bilbao Jardines De Albia is 0.3 kilometres (0.2 miles) away. 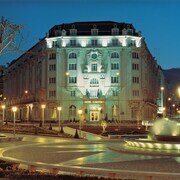 More Bilbao hotels in the lower price range are the Basque Boutique and the URH Palacio de Oriol Hotel. The Ellauri Hotela is 25 kilometres (15 miles) from the middle of Bilbao. Alternatively, the Relais du Silence Hotel & Spa Etxegana is 25 kilometres (16 miles) away. Two more hotel and apartment options worth checking out around Bilbao are the Hotel Urune and the Rusticae Aldori Landetxea. After you have seen Bilbao, you should make time to explore the other natural and cultural attractions of the Basque Country area. Basque Country has rural landscapes, beaches, coastal plains and forests, and common Basque Country sights include old towns. Popular pastimes in this particular part of Spain include mountain climbing, hiking and horse riding. San Sebastian is 75 kilometres (48 miles) to the east of Bilbao and is home to the Monte Urgull and Concha Beach. 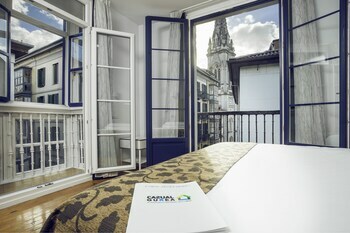 The Hotel Maria Cristina, a Luxury Collection Hotel and Rusticae Villa Soro are a few of the great long and short-stay alternatives in San Sebastian. Alternatively, you could consider staying at Old Town, 75 kilometres (48 miles) to the east of Bilbao, where you'll find the Hotel de Londres y de Inglaterra and TRYP San Sebastian Orly Hotel. The Goikoa Palace and Basilica of Saint Mary of Coro are a couple of the most popular attractions to see when visiting Old Town. Located 5 kilometres (3 miles) from Bilbao is Bilbao Airport. Stay nearby at Hotel Ercilla or Hesperia Zubialde. What are the most popular Bilbao hotels? Are there hotels in other cities near Bilbao? What other types of accommodations are available in Bilbao? Explore Bilbao with Expedia.ca’s Travel Guides to find the best flights, cars, holiday packages and more!